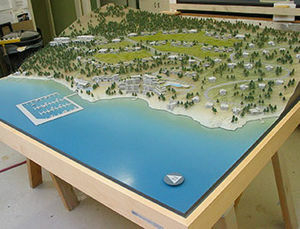 This is a 1:500 scale presentation model designed for use in a sales center. 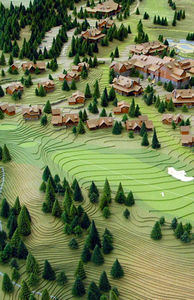 It illustrates the master plan for a resort community. Because of the quite small scale, we made the buildings as solid painted massings, and then applied the doors and windows as color “dry transfer” graphics. We were, however, able to add some of the detail (note the posts and decorative framing). 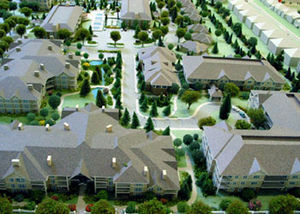 This is a 1:500 scale presentation model designed for use in a sales center. 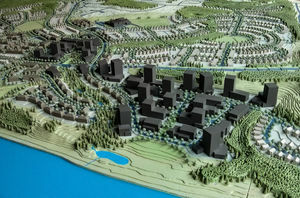 It illustrates the master plan for a resort community. Because of the quite small scale we made the buildings as solid painted massings. We designed a technique using thread to show “vineyards” amongst the structures. 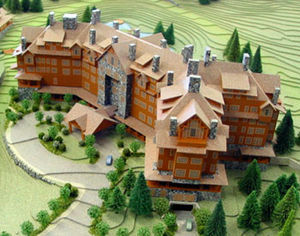 This is a 1:300 scale presentation model designed for use in a sales center. 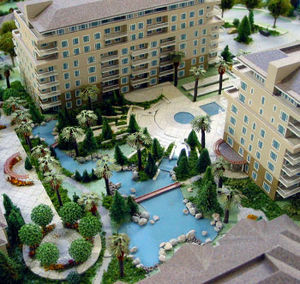 Because of the small scale it is cost-prohibitive to render the doors and windows in 3D. Instead, we made the buildings as solid painted massings and then applied the doors and windows as colored “dry transfer” graphics. 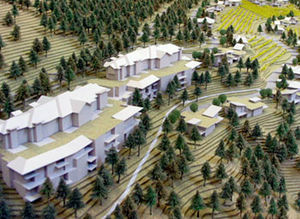 The dry transfers are made from files we draw that are based on the architectural drawings of our clients. 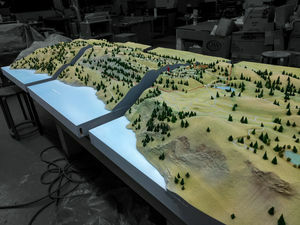 Model is approximately 14 feet in diameter and features fibre optic street lighting, an illuminated shoreline and viewer operated zone lighting. 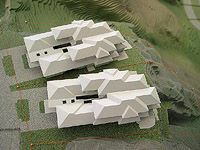 This massing church with dry transfer glazing features a lift-off roof to show a massing interior.